Days away from heading to the beach, the feeling of excitement is being overshadowed by the need to prepare. Just last week, we tried to go out to eat for the first time in a long while; we won't be heading out again for a while. I will not be subjecting the vacationing crowds to my children; it is not worth the stress, the cost, or the looks. So, I am preparing my meal plan for vacation-breakfast, lunch, and dinner. This is a family vacation; I haven't been on a beach vacation with my family since I was in college. My parents are planning to eat out pretty often, but I will be sharing cooking duties with my cousin's boyfriend. Matt volunteered to grill. Our breakfasts are easy; I will prep them the night before so that someone can throw it in the oven while I am out on my runs. My lunch options are also easy; hopefully, someone in the party will decide to head back to the house for a bit with the kids while I enjoy reading or napping in the sun. We will hit the grocery store Saturday night. I plan to buy fruits, vegetables, meats, bread, and dairy products at the store. I'll bring things like cereals, bars, snacks, and spices (I learned to do this from Joyce as I was paying $7 for chili powder while she had brought her cumin from home). The last time my mom hit the grocery store on vacation, it was after a big dinner so she and her friends bought only Breyers ice cream and drink mixes. I plan to be on hand with my list. Not sure I am as organized as Joyce who has even produced coupons for the things she needed from the stores at the beach, but I think we will be set. Traveling day...we will eat what we can find. 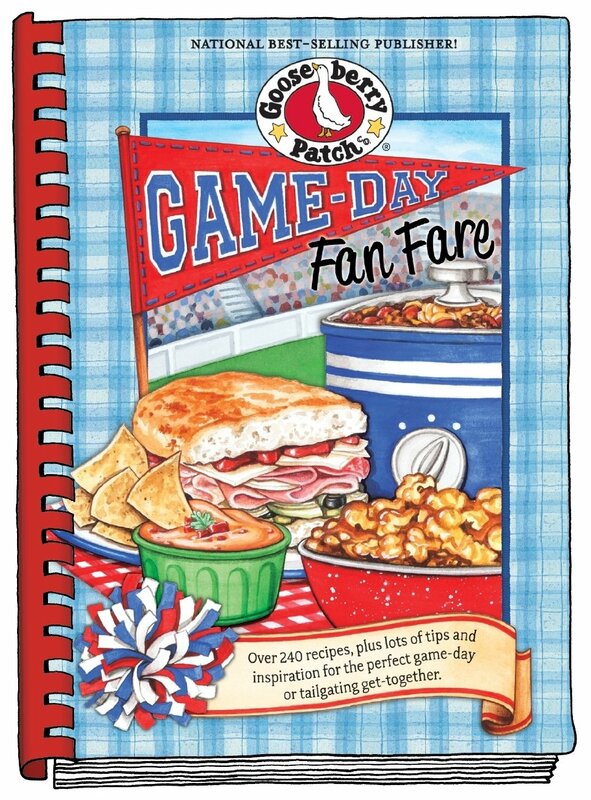 I love the newest Gooseberry Patch Cookbook Game-Day Fan Fare. The recipes in this edition are right up my alley-brunches, munchies, soups, treats. Excited to receive the new book from Joyce, I started planning what to make for Memorial Day, the annual luau, Father's Day. I called my aunt and told her to write me down as bringing the Margarita Watermelon Slices to the next pool party. I love the personal touches and handy suggestions that Gooseberry includes in their cookbooks. I already moved two ideas into my routine. Grating the peel of a lemon or orange anytime you use one then to freeze it gives you a supply of citrus zest that can add a lot to a summer salad. Using white paper coffee filters as toss-away snack holders is a frugal alternative to snack bags. I buy those coffee filters for my kids' art projects; it was such an added bonus to use them at the pool to share popcorn and goldfish snacks (and I didn't have guilt about throwing them away). Gooseberry also gives ideas for outdoor decor and serving. I have had a number of pavilion parties at local parks and getting everything to run smoothly is tricky. These hints will help your party go off without a hitch. In a lightly greased 13 x 9 baking pan, combine salad dressing, preserves, soup mix, and water. Stir in chicken until evenly coated. Bake, uncovered at 350 degrees for 45 minutes, until chicken is no longer pink. Meanwhile, prepare rice according to directions. Remove chicken from oven; stir in pineapple and green pepper. Bake for an additional 15 minutes. The second time, we had the dish with quinoa.